Tanya Hristova was born on the 19th of July 1971 in Pleven. She completed her secondary education in PMG „Akad. Ivan Gyuzelev“, Gabrovo. She obtained a master’s of English philology from „St. Cyril and St. Methodius“ University of Veliko Tarnovo. At the same university she completed a master’s of finance. She specialized in the domain of project and programme management. Tanya Hristova started her professional career as an English teacher in Veliko Tarnovo. Afterwards she worked as a free-lance consultant in preparation and management of projects with external financing. From 2008 to 2010 she was a Deputy Mayor „Sustainable development“ of Gabrovo Municipality. In 2010 and 2011 she worked as a chief of the political office of the Minister of EU funds, manager of the Central coordination unit and a Secretary of the council of control and management of EU funds. 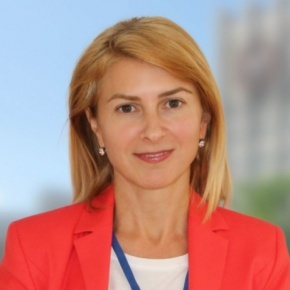 She is experienced in international negotiations and had a key part in defining the priorities, in the context of the EU cohesion policy, for the programme period 2014-2020.Tanya Hristova is a Mayor of Gabrovo Municipality in the period 2011-2015 and was re-elected for a second mandate at the local election in October 2015. At present, she is the leader of the Bulgarian delegation of the local authorities at the Committee of the regions in Brussels and a full member of the Commission for Territorial Cohesion Policy and EU Budget (COTER) and Commission for Social Policy, Education, Employment, Research and Culture (SEDEC). Mrs. Hristova is a chairman of the Managing council of the Municipal network on energy efficiency „EcoEnergy“ – mandate 2015-2017. She is married with one daughter.